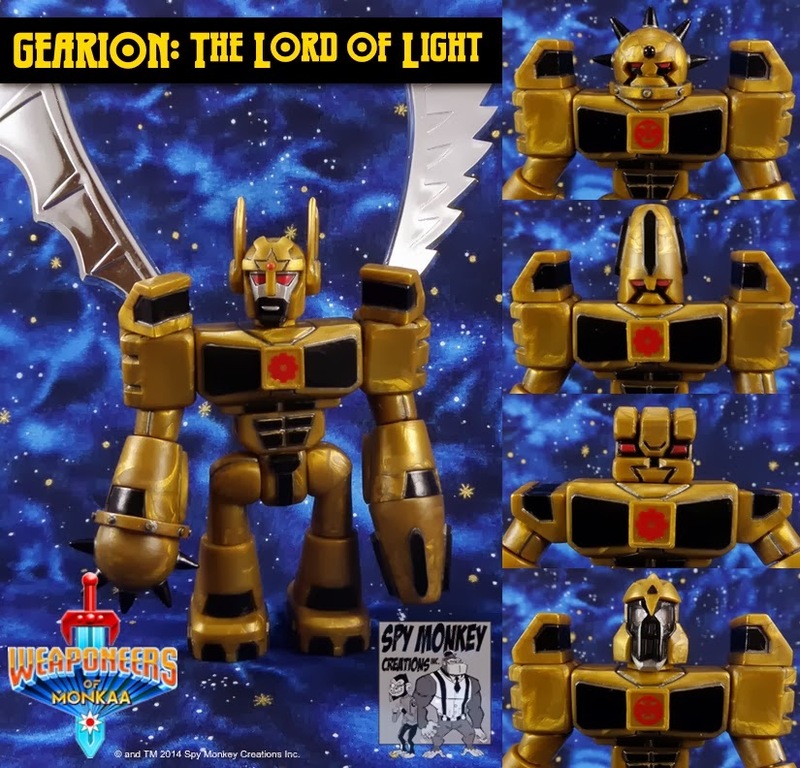 December of 2013 was a flat-out bonkers month for new toys - Onell Design, ToyFinity, the Four Horsemen, Ni Stuff, and dang near every indie toymaker seemed to have something new on deck and it's really quite spectacular just how many of them are existing items in new colors. This includes the Gendrone Rebellion Gobon, a figure whose name suggests a pretty nifty storyline which exists pretty much solely in toy auteur Matt Doughty's head. We're treated to peeks at this story, but odds are we'll never really know the full story behind many of these figures and their various factions. Spy Monkey Creations will be selling new gold and green Weaponeers on Friday, January 24, at 12:00 PST. No sign of their bright orange and black figures which were teased at Comic-Con, but these figures seem to have excellent deco and a couple of new parts are in the accessory packs. Also interesting is a special Crayboth Eaglet for $4. It has unique paint masks and more color than other Crays in the past, so if you're an Onell Design purist you might still want to be there for this really slick set of new figures. Here it is! Click here to see the January 19 2014 Onell Design drop menu. OMFG series 2 and 3 are joined by Argen in green, more clear figures, and a really cool blue Armorvor. 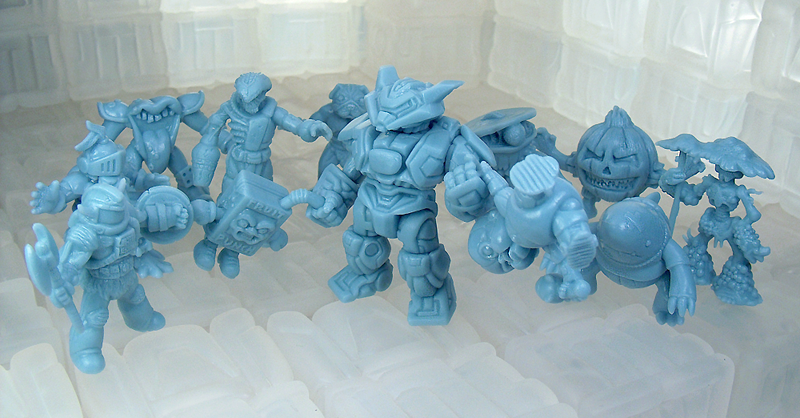 No new molds today, but there are some solid items. The blue Zombie Pheyden sold out really fast, and the Argen MK IX sold quickly as well. Many of the other items are still available, so go grab those while you can. Get your stuff, it's up early! Click here to see what's left. Full menu later tonight. 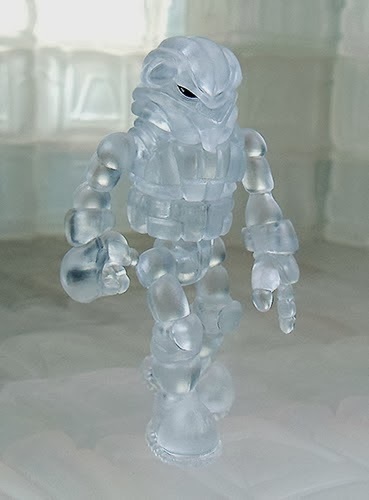 The surprise figure is a clear colorless Dark Traveler, so go snag that while you can. Zombie Pheyden, an unpainted Armorvor in Pheyden/Test Shot blue, and more are all on deck for this weekend! Click here for Mini Mission Details. No listed Crayboth figures, but a mystery item with no listed price is on deck. Ever since its introduction, variations on the Ecroyex Guardian Syclodoc have had one or two heads - this one has two to choose from, which is nice. It also sports that swell Glyaxia symbol on the shoulder, which is one of the reasons I bought it. Sure, it looked cool, but I like that logo so much I want it on a t-shirt. 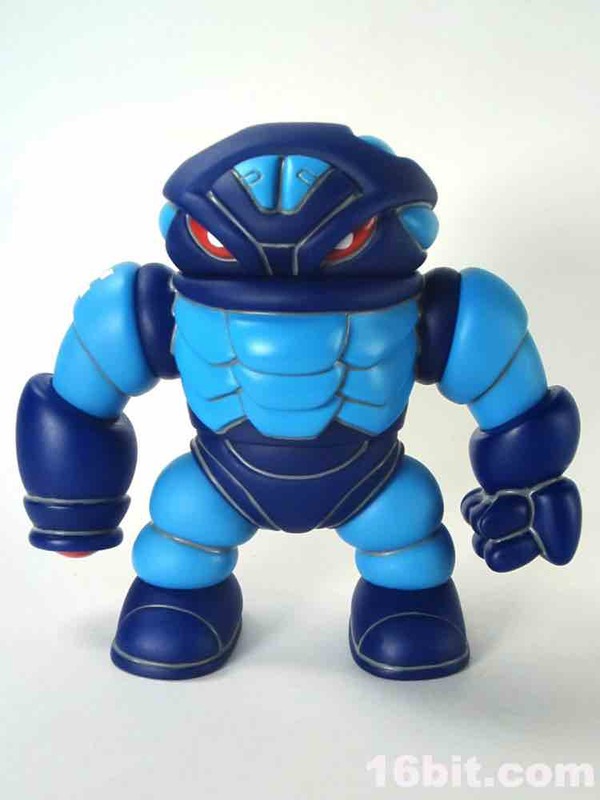 Standing at about 4 1/2-inches tall, this vinyl monster is made of 11 pieces of vinyl and the parts can be swapped with some other toys, like the Rig, the Block, or the giant Mordle. 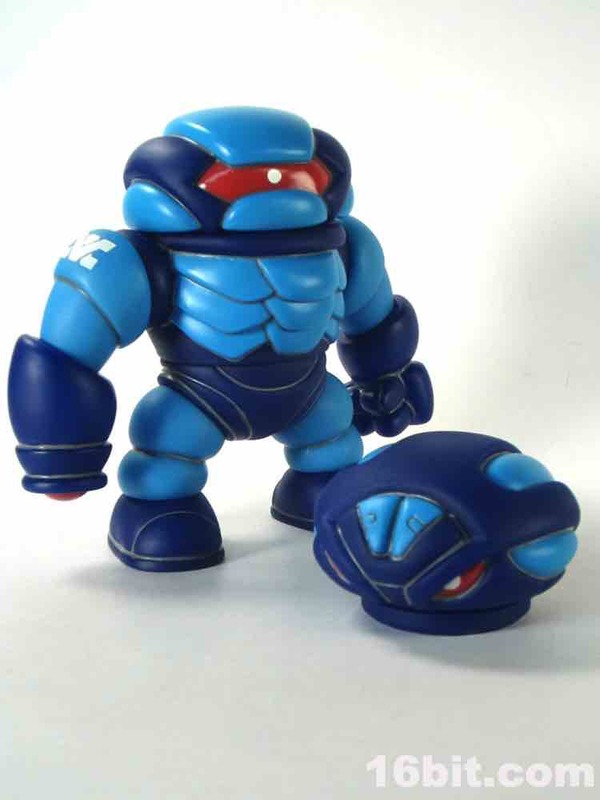 This time around, the figure has been given a giant red eye with a white dot in the center and grey panel lines - as few Glyos figures have panel lines lately, it's neat to see again. The bright red really pops in the Syclodoc's head, while the alternate Armodoc noggin looks like a drawing that came to life. The colors contrast nicely and the grey looks like it fell out of some weird ancient space painting. It's worth noting that the paint color matching is exquisite - the light blue arm and leg pieces are molded in light blue, while the head highlights are painted light blue. This is tough to pull off well, but it seems Onell Design always gets it right somehow. In a post called MK IX, Onell Design teases Argen MKIX and what may be more metallic figures. The green is the same as the Kabuto Mushi figures released last week (and delivered here yesterday), and I can tell you it's positively stunning in person. Onell Design goes on to confirm/tease/threaten more drops. Typically the toymaker puts out about 6 waves per year, now we are told to expect more mini-drops. To speculate wildly, it wouldn't surprise me if these were "remnant" waves which match other releases from the same factory - which means lots more mixing and matching. This is a good thing. Click here now to order your Kabuto Mushi figures and Mini Mushi Swarm! Big figures are $10. Mini figures are 4 for $8. At this rate I expect a fast sell-through. Not one but four styles of the first-ever PVC production figure from Marty "The Godbeast" Hansen go on sale tonight - and they're pretty cheap too! 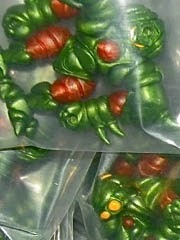 Four colors of mini-mushis are on sale as well as four varieties of full-size Kabuto Mushi action figures. There will also be clear urethane wings as upgrade parts, all of which you can click here to see in the shop. 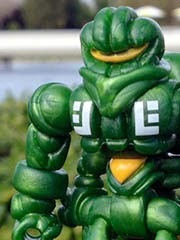 Each Glyos-compatible figure is $10, while you can get 4 mini-mushi figures for $8.